If your kid has an Instagram account, chances are they have run across or have used the new Video Chat feature that made its debut in late June. Video chats, also known as Video Calling, have become very trendy recently. Other platforms have entered, or will soon be entering, into the video calling features this year, including Snapchat and WhatsApp. Other apps that have this feature include Skype, FaceTime, Facebook Messenger and more. So what’s the big deal about this new Video Chat Feature? Tweens and Teens love to stay up to date with what’s going on around them due to FOMO (Fear Of Missing Out), and they love to stay connected with their friends as much as possible. So when you add this fun, flashy, new feature to arguably the most popular social media app out there, you get a lot of traction and usage. This new Video Chat allows up to four people to chat at once. What’s cool is you can keep scrolling through your Instagram feed while using the Video Chat feature (no one else can see your screen except you). One thing to note is you can’t start a video chat with just anyone; they need to have an active Direct thread with you to start one. If you don’t want to chat with anyone, you can mute them, and you won’t get any notifications from them. To start a chat, click the icon in the upper right corner of your screen to start a video chat with whom you want. Or go to someone’s feed and click “Message” and do the same. You also have the option to join a pre-existing group chat with your friends if it’s available and not maxed out in participators. With any video chat feature within an app, it’s important to keep in mind the risk of Cyberbullying, sexting/inappropriate content being viewed, profanity, stranger danger, etc. It’s always best to periodically remind your tween/teen about these potential dangers and what to do if they encounter any of these issues. Communication is key! Even though this will help save some mobile calling minutes with your phone provider, using this Video Chat feature can increase your data usage pretty quickly, if you’re not connected to Wi-Fi. The number one thing to implement for any app that allows video chatting would be to only talk with friends you know. If someone you don’t know enters into the video chat group you are in, it’s best to leave that group chat. And as always, make sure your settings are set to as private as possible. 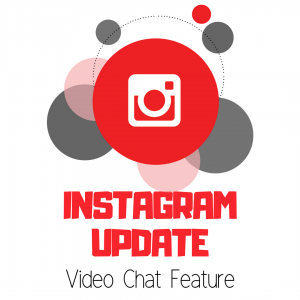 There you have it, everything you need to know about the new Video Chat feature in Instagram!